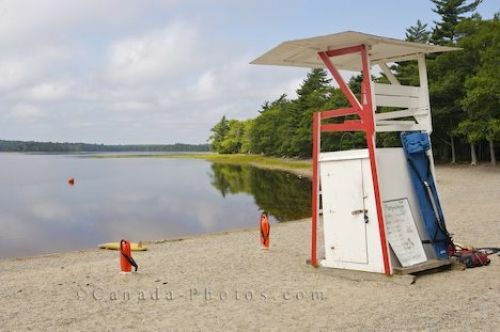 A lifeguard station set up along the sandy shores of Lake Kejimkujik in Nova Scotia, Canada assures beach goers that there is always somebody watching out for any mishaps. During the summer months, many tourists pass through Kejimkujik National Park and stop at the lake for a picnic lunch and a quick dip. Others come here to enjoy a sunny day and suntan while others arrive with the kids to let them dig in the sand and splash in Kejimkujik Lake. Life savers tower at Kejimkujik Lake in Kejimkujik National Park, Kejimkujik National Park and National Historic Site, Kejimkujik Scenic Drive, Highway 8, Nova Scotia, Canada. Picture of a lifeguard station fully prepared along Kejimkujik Lake in Kejimkujik National Park in Nova Scotia, Canada.